Each week, Violinist.com brings you links to reviews of professional violin performances from around the world. Please share your thoughts about this week's concerts (and reviews), in the comments. The Guardian: "No doubt there have been many performances of Britten's Violin Concerto this year, but few, I imagine, can have been as searching and startlingly fresh as Isabelle Faust's, with its savage, selfless precision, rasping double stopping and sense of always knowing exactly what the destination of this disquieting musical journey really was." The New York Times: "Mr. Hadelich’s combination of rich-toned elegance and impish spontaneity was wonderful." Chicago Sun-Times: "The third movement “Passacaglia” gave way to an extended cadenza, which Ehnes made his own, starting quietly and then letting all the pent-up tension spew forward in a tumult of agitated introspection." Chicago Tribune: "You won't hear this music played more skillfully than here." Detroit Free Press: "Violinist Anne Akiko Meyers gave off a charismatic gleam in the demanding solo role." And a nice general quote from this reviewer: "Going to an orchestra concert should be about more than just hearing your record collection played back at you — though that’s fun, too. But there should always be some suspense when the lights go down: What’s going to happen next? "Surprise" as a quality of the artistic experience is underrated, especially in classical music. The good news is that lately there’s been a lot of it at Orchestra Hall." Pioneer Press: "Copes had already helped establish the vibrant tenor of the concert as the soloist on Bach's Second Violin Concerto. His gracefully fast fingerings were invariably impressive in the first and last movements, but the mournful Adagio was the most arresting section, its sad tones handled as gently as one would an antique glass ornament." The Australian: "Devoid of theatrical sways and superfluities, he is all energy and expression concentrated where it matters." The Sydney Morning Herald: "Christian Tetzlaff gave a sensitive reading of the Mendelssohn Violin Concerto, at times verging on the dangerously soft, but taking the outer movements' action-packed pages at full bore, urging the pace as the codas got under way but impressing for his responsiveness to each sentence in a construct where the soloist has little space to draw breath." Mid Sussex Times: "The 43-year-old has been a prized guest of the Brighton Philharmonic Orchestra before thanks to his Covent Garden connections with their music director Barry Wordsworth but this time it was an especially memorable visit as Tchaikovsky’s Violin Concerto in D gave him the opportunity to show his immense talents to the full." The Washington Times: "This is a bright, sunny, youthful work—Mozart was just 19 when he composed it—and that’s essentially how the NSO and Ms. Bar-Josef approached it." The Washington Post: "She is such a sunny and fluid player that it was odd to find her a little stiff; even her playing took on some of the self-conscious awkwardness of the orchestra around her." 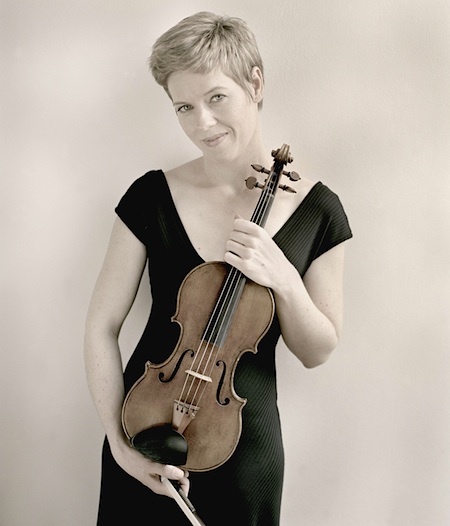 San Jose Mercury News: "She did it again Saturday -- left them on their feet, cheering -- after she played Tchaikovsky's Violin Concerto with the orchestra." San Francisco Classical Voice: "Now a mature 27, Kamio plays with an intensely tragic facial expression and a highly distinctive violin sound." I am glad to see that Isabelle Faust is a fan of Berndt das Brot. I think you misunderstood. She obviously doesn't use her hands to play the violin, instead willing it to play itself through facial intensity. But I do worry about her getting wrinkles.